Peli Cases have been made specifically by SFL Mobile Radio and have been designed as a rapid deployment two way radio system. Designed for ‘Mission Critical’ environments, SFL have developed an extremely flexible and immediate deployment solution to offer all your digital radio needs housed within an extremely durable Peli case application. Designed around the versatile and powerful MOTOTRBO digital high tier portable range of radio, the ‘Rapid Deployment’ radio system allows the user to ensure all their communications equipment can be accessed without delay whilst operating one of the most reliable radio DMR brands in the World. The radios and accessories are housed within a watertight, crushproof and dustproof protective case from the Peli Storm range of industry leading durable cases. 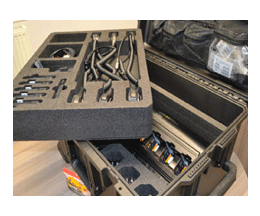 The Peli case is supplied with wheels and a telescopic handle making it extremely simplistic to transport. It’s rubber over moulded handles ensure complete grip when carrying the case in the most harsh climates. Peli Cases from SFL Mobile Radio are a rapid deployment two way radio system that has been built and manufactured for industries such as the military and emergency services.